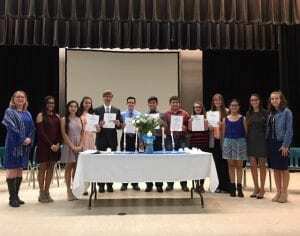 On Wednesday, December 5, Pleasanton National Honor Society inducted nine new members. NHS picks students who best represent the four pillars: leadership, scholarship, character and service. Pictured above, left to right: Advisor, Mrs. Leonhardt; Secretary, Felicia Patel; President, Sydney Sykes; Inductees: Celia Alvarez, Matthew White, James Barcomb, Keith Cordova, Garrett Lopez, Trisha West, Skylar Schimelpfening; Treasurer, Zorayda Martinez; Vice President, Madeleine Guajardo and Chaplain, Melody Johnson. Congratulations to the new NHS members!